I sincerly hope that you have had some interesting meetings with the Danish government and have succeded in convincing them about the brilliant PBP. Denmark would be perfect as we (almost) have the virtual oilfield in place and distances driven in Denmark are quite short. I will be keeping an eye out for your start-up in Denmark and when/if it happens I will be the first to apply for a job in your organisation! 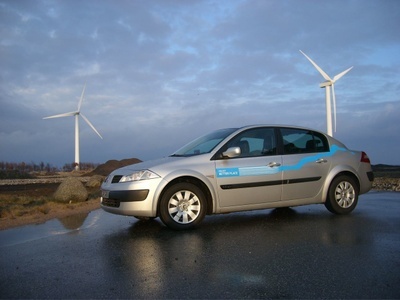 Until then I will be reporting on your progress around the world in our discussion forum at www.danskelbilkomite.dk (Danish Electric Car Comitee). Sounds great - our company is interested in participating in your trials - we have a significant car fleet in Israel as well as operations in Denmark. working with Josh on this! Sounds good , but if you use solar power stations with windmills , its a perfect combination for producing electricity 24/7 day and night . It is amazing what you're doing with Alternative Energy. The Israeli Hi-Tech industry could contribute to these efforts. I have few ideas about it. Congratulations on your efforts. I have been thinking along similar lines for a few years now but never have been in the position or had enough capital/contacts to get it done. I live in the UK and we have large city centres which are too congested and polluted, plus our fuel is very, very expensive. Anyway I'd love to get involved if you make a move on the UK. Finally someone sold the right idea to the right people here in Denmark. Who else but the former oil giants of our country could/should finance this important change to virtual oil. Way to go Shai - You are in our minds as the realization of our best dreams for the future! Pleas sign FIAT, and BMW inn the ev program. I just love the Fiat 500. but only the EV version. that car just says please, come and drive mee i´ts just so cute. The ev fiat 500 can cost less than. 7000 euro´s pr car + leasing off the battery pr km. The fiat 500 got a WAF faktor off + 1000%. The EV version, i´ts even more. A EV fiat 500 for my wife, and a EV BMW for mee pleace. Bravo Shai, for showing how the world can turn green "overnight." As the first accredited blogger at the UN conference on Climate Change in Bali last December, I have been on the watch for hopeful ideas. However, what you have created here is more than a great idea. It is a key piece of the future, and a giant step in moving us toward a fossil free world. I really appreciate your effort to implement a consumer friendly electric car infrastructure. It is too necessary for our future and obviously it is a great business opportunity. I think we have to get rid of this mentality, that sustainability and a green way of living is just something for NGO's and that there is no profit to make. If we / you can show that there is good business and money to earn with sustainability, more and more companies will be convinced to change their policy. It's all about awareness. Shai, I'd like to formally meet with you when you come to Santa Monica for the Milken Institute's Global Conference - I am attending and you can look me up on Milken's conference profiles. As the executive director of the organization below, we have several national and international campaigns focued on what we call Green in the Tank and Use....Less, Again, and Green - all things leading to ending our oil dependence. I want to discuss facilitating a pilot effort on the US side matching your Israel program. Your work is just the kind of key initiative that we're looking to promote as "must do" imperatives in the US - our contacts, our campaigns (much has not been released on our website and will be public in June)and our supporters are at your disposal - would very much like to explore how at the Milken conference. I can be reached at tsaville@endoil.org. More info on EO is below. We believe the energy system of the future must be safe, clean and green, and sustain us without causing social, environmental, or political damage or disharmony. Watch words are efficiency, conservation, renewable, cleanest and zero-carbon, sustainable, and independent. Our initiatives are focused on all things leading to green, energy independence without oil. We promote the importance of harnessing the power of the sun, wind, or geothermal power, clean bio-fuels and alternatives to dirty fuels such as cancer-causing diesel, and advanced battery storage systems to electrify how we get from place to place, which have the added benefit of reducing our reliance upon non-renewable and environmentally harmful resources to fuel our homes, communities, and businesses. Our mission is to end national and global oil dependency through education and by promoting action and working with like-minded organizations and partners - moving individuals, governments, and civil society towards non-petroleum, and environmentally and socially responsible sources of energy. EndOil is a national 501 (c)(3) non-profit organization that creates, invests in, and administers education campaigns, and which conducts research, and creates forums and tools for discussion and debate on solutions and barriers to ending our oil dependency. EndOil also supports the initiatives and missions of other community-based organizations, environmental advocates, private industries, governments, and individuals which are consistent with our mission and which carry the greatest promise in delivering a green, sustainable, independent, and oil-free future. At EndOil, everything we do is intended to inform, encourage, inspire action, and promote collaboration among stakeholders. I think your business model could also work for the area of Berlin/Potsdam and the surrounding county of Brandenburg in Germany. Brandenburg provides the second largest windpower park (3,3 MW) of german counties. Berlin, embedded in its geographical center, wants and needs green cars. So why not use the Brandenburg windmills for fueling Berlin's and Potsdam's auto traffic...? I live in Denmark and have a couple of questions about this project. What would the monthly leasing cost of the batteries be for people who buy one of your vehicles? How fast can the battery be charged? Can you charge the battery at home with a normal plug? Why dont you use the same nano lithium batteries as in the Zap X car with a 500+ km range, and only 10 minutes charging time? I made Alyah 5 years ago from France. Since I was at my bar-mitzva age, I was very into making "the world a better place", I even became the head of the Jewish French Scouts in Meudon (e.e.i.f), because I thought that education was the best way to make those changes happen. I am now finishing my degree, in management with a specialization in finance in the IDC Herztlya university. we need to stop being everyone's problem and start being everyone's solution. I think in the same way as you do, It's exactly my point of view, and my wishes, and I would love to participate to this giant enterprise. I think your project is the best for my self-motivation, because this is what I have always desired to do. As this project is made in collaboration with the French car-maker Renault, I think it would be a great opportunity for both of us, to have me in your team, as I speak perfectly French English and Hebrew. How can i get in touch with your company and get more involved in this operation, because i really feel that I can be more than useful. Almost all wars and terrorism in the world can be stopped. Almost all dictators and tyrants can be rendered powerless. All we have to do is to stop paying them. An alarming amount of the money Western nations pay for oil is going into the coffers of people who are terrorists and dictators. All we have to do defund the world’s most violent criminals is to become energy independent. In the first phase of energy independence we get as much energy as possible from resources which we own or which are in the hands of friendly, stable nations. First we build new nuclear power plants in every state. If the French can make nuclear work what excuse do we have? If France’s success isn’t incentive enough, consider the success of Denmark, Brazil, and Australia in diversifying their energy supplies. In addition, we drill for oil off all our coastal waters and we build new refineries and pipelines in every state. We must burn more coal and use more natural Gas. Existing energy companies are making plenty of money in the current climate of false scarcity. We will have to find away around them. Usually the way around greedy energy companies would require political will. However, almost all existing politicians are in the pocket of the energy companies. This includes democrats and republicans. So every politician currently in office needs to be thrown out. Anyone who works for or who owns an existing conventional energy company is in my view disqualified for public office. We already know from the Bush/Cheney experience that such politicians will work in a way contrary to the national security of the United States and will start pointless wars for oil. Every time a new oil war start conservatives get paid. That is why no conservative supports plans to gain immediate energy independence. Merely having new politicians willing to clear the legal minefields laid down by oil bought senators and congressmen might not be enough. We might have to get a little bolder. Therefore I suggest that we build terawatts of new nuclear power plans and miles of new oil refineries in Mexico and that we send the power back to the states via pipelines, power lines, hydrogen, or whatever works. This will provide work for Mexicans and energy for us. The Mexican government will have a large incentive to make the plants secure and this increased security might even spill over to the borders and make our borders more secure. While phase one is going on we need to start on phase 2. In this phase we bring online as many green and renewable technologies as are currently viable and put as much money as is needed into producing more. I would suggest that the model cities be built in the west and south—anywhere that it does not get cold enough to snow. The idea is to build small towns or cities that will go cold turkey. There will be no fossil fuels of any kind allowed in these cities. All vehicles and houses will be powered by wind, solar and bio-mass. The best locations would be those that have year around wind, sun and enough farming in the area to produce the bio mass. These experimental towns would be off the power grid. The only way to get power to them would be to make the green and renewable technologies work. Volunteers who truly believe that the future is green would be invited to apply for residency. We would probably take engineers and farmers over other types because we would need people who were skilled in keeping the power conversion machinery going and others who don’t mind the get their hands dirty hard work of farming. Another part of the second phase will involve green government. In a free society you can not tell free citizens they must go green. But you can tell government at all levels that it is prohibited from using non domestic sources of energy and non domestic products. Considering that today, at least in many developing countries, most of the electricity is generated using natural resources, is there a environmental benefit in using electric cars? For example, if we use 1 litre of petrol to drive 15 KMs in a conventional (may not be the right word) car, how much petrol is required to produce enough electricity to drive an electric car for 15 KMs? This is a very elementary question, but I was very curious about whether adoption of electric cars in isolation has any ecological benefits?